Image from David Ascher on Flickr. There are not a lot of foods that can pass for an acceptable meal at breakfast, lunch, and dinner, but crepes are one of them. Long-considered to be merely dessert or quick Parisian food cart fare, the quintessential French food has much more to offer and should be considered one of your culinary staples. The dish is easy to make—from the moment the thought of eating enters your mind to the moment you are eating the crepe, only 15 minutes should have elapsed. The recipe demands nothing exotic, unless you wish to go over the top and garnish your crepe with something fancy like bourbon or pear chutney. The beauty of crepes lies in the fact that they’re nearly impossible to mess up. You can use your imagination to make your dish unique. If you think it would taste good inside, throw it in! For breakfast, add scrambled eggs to your cooked crepe. For lunch, throw some ham and cheese inside, and for dinner add some chicken and spinach. For dessert, you can’t go wrong with Nutella spread all over those layers of goodness. The options are endless and almost always delicious. You can buy a special crepe pan and tools, which do help, but these are not a necessary part of the crepe experience. Throw all of the ingredients into a big bowl and mix until the consistency is fluid. Then find a big wide pan and spread a thin layer of batter on the hot pan. Let it cook until you get big air bubbles, then flip. You will likely mess up a few until you find your technique, but don’t give up! 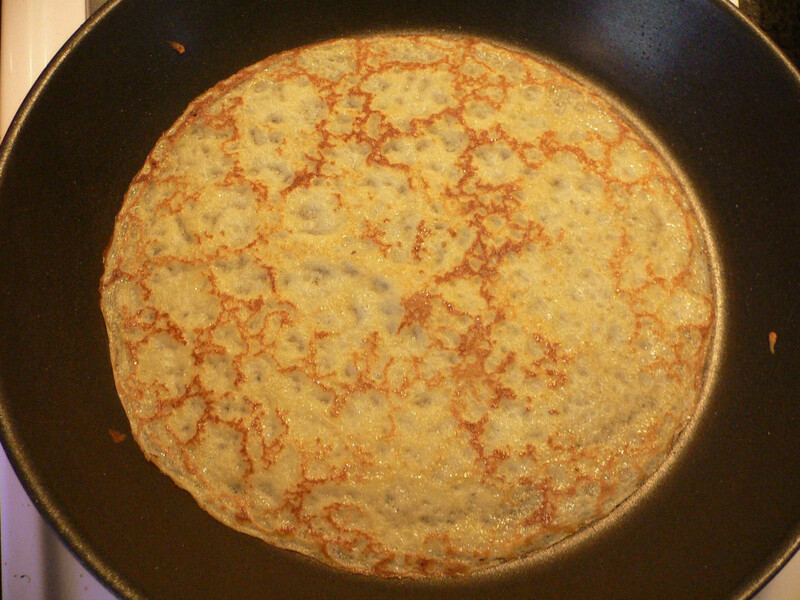 Add your filler food while the crepe is still on the pan, close the crepe over the filling, and before it all burns—serve it up!